I made a small contribution to a post over at Art of Blog on the topic of uncertainty the other day. 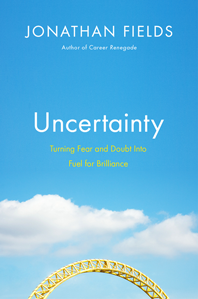 The post is to promote the upcoming book by Jonathan Fields called, unsurprisingly, Uncertainty: Turning Fear & Doubt into Fuel for Brilliance. It’s a topic deeply personal to Jonathan, as you can see in his book trailer. You can check out the first link for my riffs on the topic, and you’ll definitely want to preorder the book if you have even a remote interest in the topic. I’ve had a few conversations with Jonathan about the book as it was coming together, and it will be exciting to see the leadership he’s able to provide in this space. With a background involving law, entrepreneurship, and writing, we will all benefit from some illuminating insight on how Jonathan’s life (particularly in the years following 9/11) has been impacted by uncertainty.